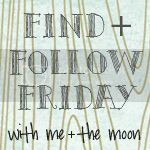 Today I'm co-hosting Find + Follow Friday with Nicole from Me and the m00n. Come and join us! I came over from GFC Collective and I love all of these ideas to help spread blog love! I linked up and am your newest follower.